This beautiful and vibrant Lamb’s Ear Rose Campion (thanks, Ann and Marcia!) is right outside my office window. Pretty, yes? But I still won’t miss it when I’m on vacation next week. I’ve never seen the blossoms of lamb’s ear before. Very pretty! Are you going somewhere fun on vacation or just relaxing at home? Beautiful! Have a GREAT vacation…going anywhere special?? If you are heading down to Cape Cod…have a blast!! gorgeous Carole! we have them growing here too and boy do they ever spread. 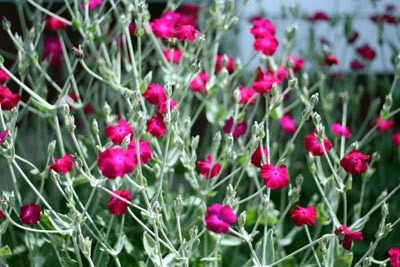 btw, it is not Lamb’s Ear, but Rose Campion or Lychnis coronaria. Beautiful! Have a great vacation. Ann beat me to it, which is a good thing because she remembered the botanical name! I had Rose Campion all over the yard for a while, but only in one little spot now. If it were better behaved, I’d plant some more. I just love your photography, Carole. Eye candy, indeed. Have a great weekend, and happy belated birthday to Dale! Have a great vacation! Swill something good next Friday. Lovely! Have a fabulous vacation. We’ll miss you. Have fun! Stick your toes in the sand for me will ya? It must be nice to look at something so pretty at work! Have fun on vacation.